If you are reading this, we’re going to assume that you’ve already taken the first vital step in planning a wedding, namely getting engaged to someone charming, delightful and good for the long haul. You have caught the love of your life. With that accomplished, you could conceivably finish off the project by going down to the local government service center, getting a license and getting married, all in less than two weeks’ time. Anything additional you do is gravy and that’s an important thing to remember when people are telling you that you “have to” have a ring bearer, an ice sculpture, or a pale blue garter. But let’s face it – most of us want the gravy. But this meal is a big meal… OK, let’s drop the cooking metaphor. In short, planning a wedding is a big deal, not simply because it’s a beautiful, magical, never-to-be-forgotten event but also because it is a lot of planning, expense, work, focus, stress and potentially hassle. But all these things can be minimized. But where to start? Getting started with planning a wedding really isn’t all that difficult. The devil is in the details but, for now, relax and let us walk you through the the planning steps to lead you down the path to your beautiful day. The two most important people on your wedding day are the bride and groom. But this should be balanced by also thinking about the celebration that will please the hosts (if either set of parents is inclined to whip out a charge card and offer to pay) and your the guests. So planning starts by talking about what it might be practical, appropriate, and fun to do. What do the families expect from a wedding? Will there be major problems if you want to do something different? Do either of you have religious beliefs that affect your hopes for a wedding? Do you know what your faith requires? Are you planning an interfaith wedding and, if so, what are the implications? What kind of budget limitations do you expect to have? If the budget is really, really tight, what elements would be most important to each of you? When would you like to have the wedding? Are there reasons to hurry or to wait? What were your favorite elements of other couples’ weddings? What have you sworn that you’d never, ever do yourself? What surprise might your consider to make your day magical and special for everyone attending the wedding? How much time and effort is each of you willing to put into the project? It can be very helpful to start this talk with one of the pocket-sized wedding planner books that wedding magazines and some bridal shops give away for free. These little books provide a list of every element that might possibly go into a formal wedding. Cross out the items that you don’t want to include, and make notes about the items where you agree on what you want, or where more research is needed. Talk with parents. While it is not considered quite right to ask parents directly for financial help, it’s acceptable and practical to ask what sort of participation they want to have. And, while you shouldn’t sell honors like escorting the bride, you can certainly negotiate what kind of help is most useful once an offer to help is made. Check into the legal and religious aspects. Make sure you know what is required to get a license and have a legal ceremony. If you want a religious ceremony, talk with a minister now. Some churches book 18 months in advance; others are happy with three or four months’ notice. Do some preliminary shopping. Put your major effort into looking at the cost and availability of reception sites, as these vendors book the furthest in advance of all wedding vendors, and your decision here has the greatest impact on the style of your celebration. But also start collecting information on local florists, photographers, caterers, and any other vendors you may need. Once you have a workable plan, it’s time to get real. Depending on how formal your wedding will be and how great the competition for vendors in your area is, you may be looking at 18 months until your wedding day, or you may have just a few weeks to go. But you’ll have that part straightened out from your research in Step 2. Now you need to reserve ceremony and reception sites, making sure that the end time of the ceremony and the start time of the reception make sense together. Do this first of all your reservations! Photographers, videographers, caterers and popular wedding musicians tend to book early, as do florists who handle really elaborate work. Start shopping as early as possible; you can always delay decisions with vendors who don’t need much lead time. The traditional order-ship-fit method takes about nine months. Even if you’re buying off the rack, it’s good to start shopping a few months before the wedding in case you have trouble finding something. Wait until you have less than one year before the wedding, to minimize the likelihood that friendships will change. The problem of attendants’ dresses doesn’t really need to be tackled until six months ahead of the wedding. Men’s clothing can be reserved as little as six weeks in advance. Invitations go out 8 weeks before the wedding. 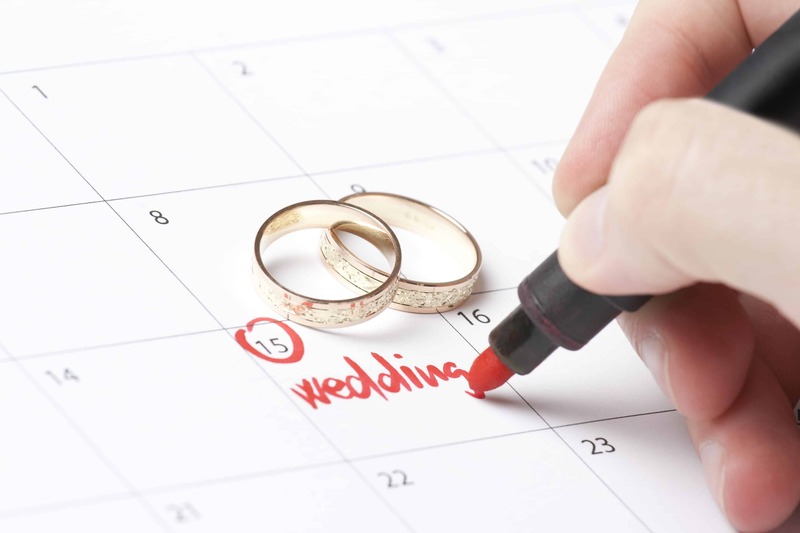 Start your planning about four months before the wedding day. If you plan to make favors or other items yourself, start early. Making 200 favors takes a surprisingly long time, and you may just get busy in the intervening months. If you’re going to register, you should do it before the invitations go out, as that’s the signal for people to start asking where you’re registered. There’s no point in doing it years in advance, as store inventories can change radically, forcing you to redo the whole list if your favorites are no longer in stock. A foreign honeymoon usually requires reservations made 4 to 6 months in advance. A local vacation can be planned much more quickly. This is the part a surprising number of couples leave to the last minute! Start thinking about the ceremony as early as possible, making sure that you know about any religious requirements. Whether anyone will throw you showers. What sort of bachelor/bachelorette parties you’ll have. Whether guests are actually buying off the registry. What anyone other than the bride, groom, and their attendants plan to wear to the wedding. All of these issues are Somebody Else’s Problem. Leave them that way. Calling vendors to confirm orders. Appointments for beautification of the female members of the wedding party. Assembling kit of things you’ll need for the wedding day. Supplying wedding-day itinerary to wedding party members. Don’t forget to keep up on thank-you letters for gifts received before the wedding! And, on the day of the wedding, make sure that you relax and enjoy yourself! You’ll note that I haven’t made a detailed list of everything you must do a year before the wedding, six months before the wedding, and so on. That’s for three reasons. First, these lists are in every wedding planning book or magazine in every bookstore or library, including the little freebie booklet that you’ll use for your first discussion with your fiance. You can even get a detailed checklist online from John and Amy’s wedding. Second, these lists assume that you are having the most stressful and elaborate formal wedding imaginable, and you’re not necessarily planning to do that! What makes it a wedding is that two people get married, not the reception menu. And even a fairly simple party requires some planning. Third, almost any rule about when you must do something can be broken if you’re resourceful, flexible, and lucky. If you somehow don’t have a wedding gown two weeks before the wedding, you can buy a white dress off the “prom” or “evening” rack at any department store and get on with life. The attendants can come to the mall with you and choose their dresses, or they can each wear their best dresses and carry white bouquets (white goes with everything!). If the reception caterer vanishes the day before the wedding, follow the example of the famous Washington hostess who ordered Popeye’s fried chicken delivered (and was complimented on her wonderful cooking). As long as the law and, if relevant, the religious authorities, are satisfied, you can cope with anything else.